David Choe continues to kill it in every way. While it's easy to attribute the amount of success he's had in 2012 to the massive amount of press he got for his $200 million-valued Facebook stock, he's still an awesome artist who knows how to market himself. Of course, that's what got him on the radar of Mark Zuckerberg to paint the Facebook offices in the first place, in exchange for those stocks. Most recently, he painted vibrant murals inside the Denver International Airport and updated his Facebook profile with 25 new works that are in various places. 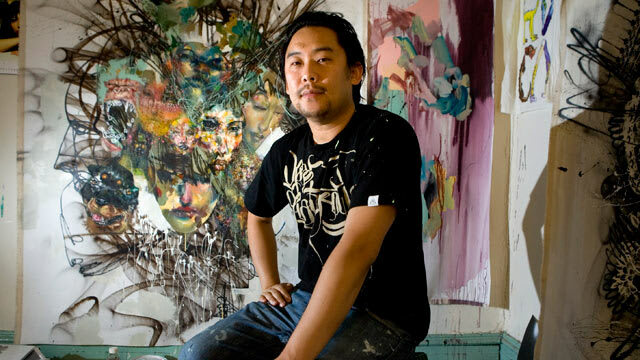 David Choe is already poised to be a huge figure in art history, and his work and heightened fame in 2012 are no doubt going to be a part of it.